The amazing unguided tracking accuracy of the NEW Fornax 10 LighTrack II is in its own league. Capturing pin sharp stars at 200 mm or more focal length has never been easier. The LighTrack II also presents the best available value-for-money price without any compromise. Most DSLR camera exposures are around 6 minutes or less. The peak-to-peak unguided tracking error of the LighTrack is around 2 arcseconds, and sometimes it gets as low as 1 arc seconds peak-to-peak. This is a significantly lower value than most competing products feature and is comparable to tracking precision of very serious, observatory level heavy-duty telescope mounts, like a Paramount. 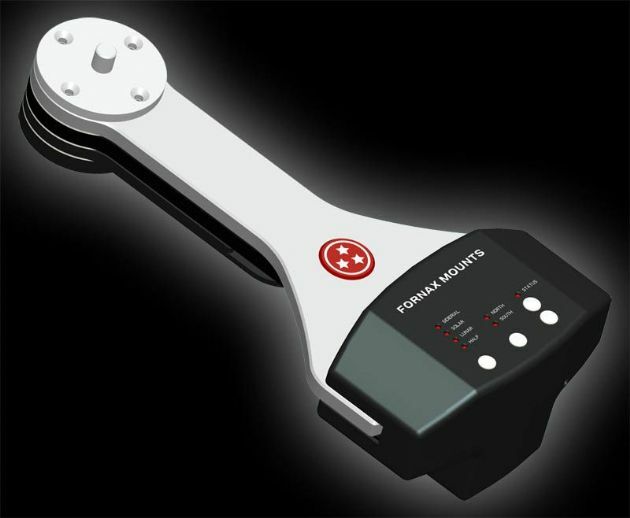 All LighTrack units are individually calibrated at the factory, so you do not have to worry about the tracking rate. Measuring and adjusting the tracking rate is not an issue anymore, since this unit runs at just the right speed to prevent your images trailing. The LighTrack provides you with optimum tracking accuracy due to strict production tolerances and it is guaranteed to stay reliable for years to come. At the heart of the LighTrack is the precision motor and the friction drive. 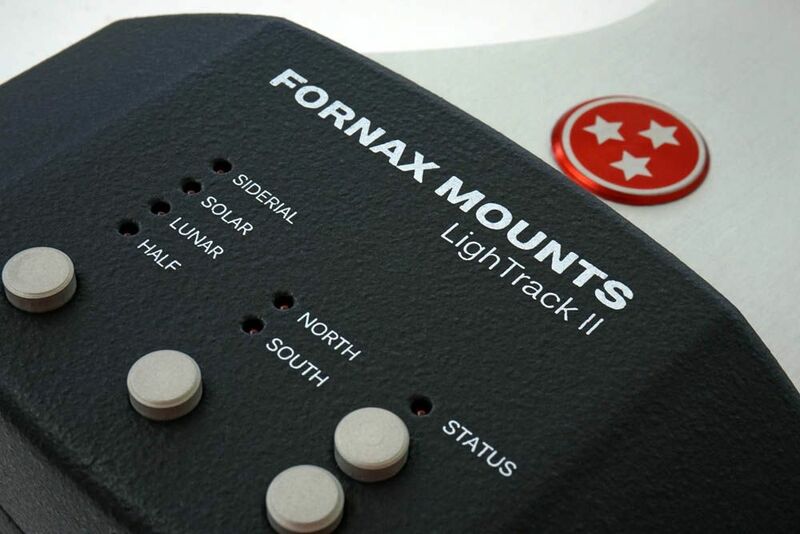 The Fornax 10 LighTrack Mark II can be powered by a 12V DC source with a 2.1mm/5.5mm plug widely used for powering astronomy equipment, i.e. Celestron, Skywatcher telescopes, Astrotrac and other devices. A 12V DC mains adapter is included, but there are other ways of powering it as well as when you travel you might always be able to use a mains socket. Please note that it will be your responsibility to use the included mains adapter safely. These are designed for internal use, so when you use it outdoor, make sure that you use a socket (or extension) that provides RCD protection. Stand alone RCD masterplugs are also available from various supplier, so for your maximum safety we would recommend to use one of those between the extension (if use and extension) and the property's mains supply. 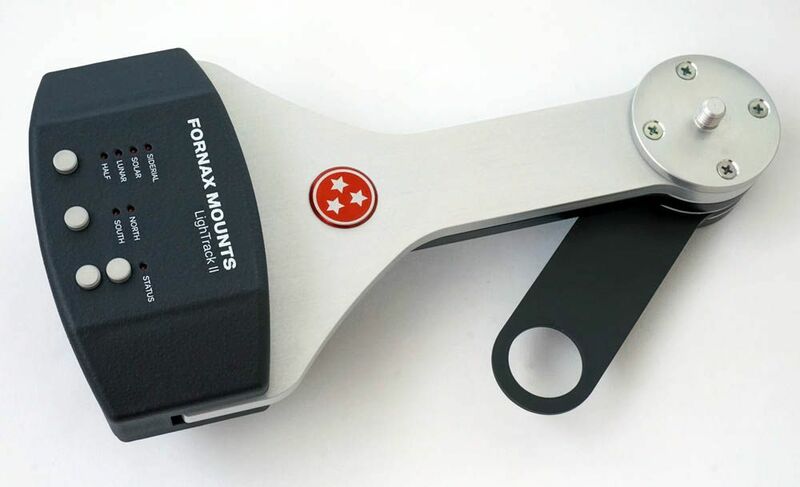 The Fornax 10 is also compatible with our 12V AC Adapters, 12V power tanks from Celestron, Skywatcher and Tracer. A polarscope adapter ring that allows to use a Skywatcher Polar Finder is included for free. These accessories can be added using the drop down menus next to the add to cart button.